Storage Tank: Stainless steel inner and outer tanks with highly efficient PUF insulation, which keeps the water hot for a refreshing bath in the morning. 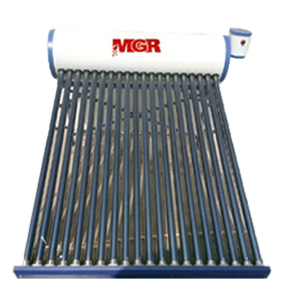 Electric Back Up: Solar Water Heater is equipped with a heavy duty electrical backup and a thermostat for saving hot water during monsoon or heavy usage. Support Structure: The chassis is made of powder coated mild steel making the solar heater corrosion resistant and also ideal for coastal location. Sun Tracking: Its innovative round surface allows maximum exposure. Its tubes remain aligned to the sun all day long and heat the water faster and keep heating till sunshine.welding process. 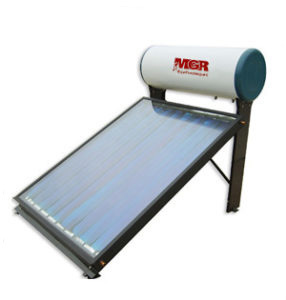 Make up Tank: A neat and clean insulated make-up tank can be mounted on top for equalizing water pressure/flow to heater. One time investment long time benefit.